With more than 500,000 vehicles sold worldwide since the launch of DS 3 in 2010, DS is building on its success and is now a brand in its own right. 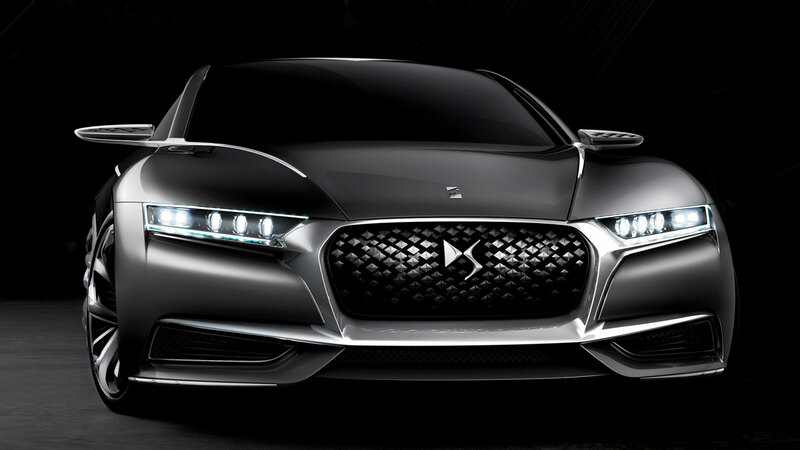 Designed and created in Paris, the DIVINE DS concept is an expression of the brand’s DNA and captures the very essence of DS. Unique styling cues: DIVINE DS is spectacular, elegant and enchanting, with a subtle shimmer in its metallic grey bodywork. The strong, sensual curves showcase some striking graphic features, such as the ‘DS Wings’ at the front; the dramatic lines on the sides; and the unique roof design. This is a concept with a stand-out exterior and an exceptional interior. 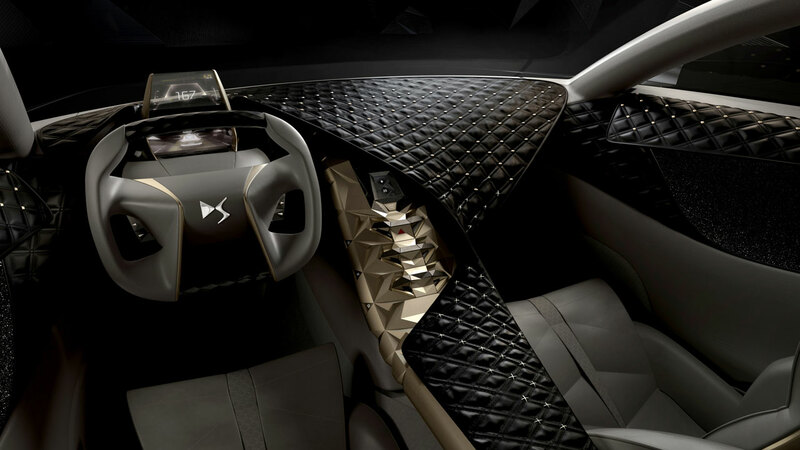 The striking cabin design features a bold, high-tech layout with spectacular contrasts, expressing the avant-garde design, refinement and sophistication of DS. A new automotive experience: With a new and exclusive philosophy for personalisation – referred to as ‘Hyper-typage’ – customers are invited to choose an interior trim that truly reflects their personality. The cabin of DIVINE DS features three interchangeable interior ambiences, each with its own original and unique style. A modern take on French elegance: DIVINE DS reflects the combined expertise of several prestigious fashion names, such as Lesage for embroidery and crystals from Swarovski. The involvement of these firms demonstrates the ambition and capacity of DS to overturn established codes and to bring different worlds together. Technology contributing to style: DIVINE DS is a concept with a dynamic design, featuring futuristic, avant-garde headlights combining sequential indicators with laser technology; facets on the roof that open to reveal a reversing camera; and optimised aerodynamics. Inside the car, the ‘cockpit’ driving position and exclusive use of digital systems (touch screen, holographic display, etc.) showcase the latest in-car technology. “DIVINE DS is an expression of our expertise. 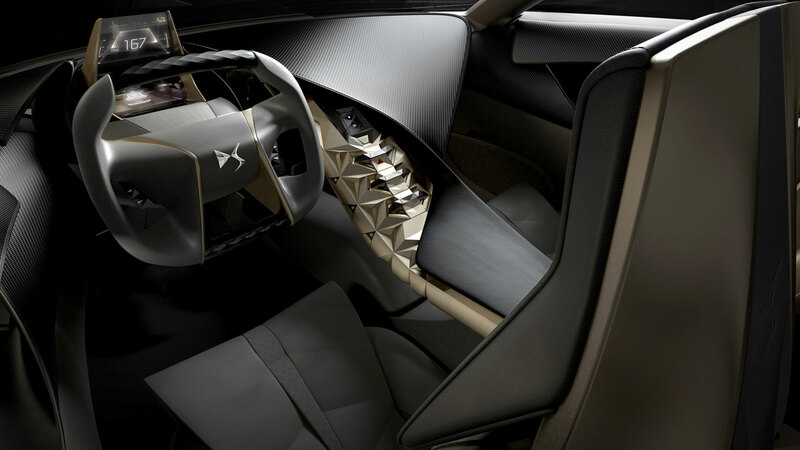 This concept car is the very essence of what DS is and what it will be.A perfect alliance between sophistication and technology. Unveiled just a few weeks after the birth of the brand, DIVINE DS perfectly expresses the unique personality of DS.” Yves Bonnefont, CEO, DS Brand. DIVINE DS is a compact 4-door vehicle, 4.21m long and 1.98m wide. It is characterised by its powerful and charismatic styling, with taut lines and a low driving position (1.35m high). Strong, sensual curves contrast with graphic features sculpted in chrome. DIVINE DS features metallic grey bodywork with a subtle shimmer that accentuates its lines. The body style captivates the observer at first glance with bold styling cues that reflect the image of DS. The wide, powerful front end features the ‘DS Wings’ signature that was first seen on DS 5LS. With DIVINE DS, this has been accentuated and is more upright for a heightened sense of prestige. In the centre, the radiator grille provides a stunning setting for the DS emblem. Floating diamond shapes, of different sizes and in varying shades of chrome, reflect light to give the radiator grille a ‘spatial’ effect. 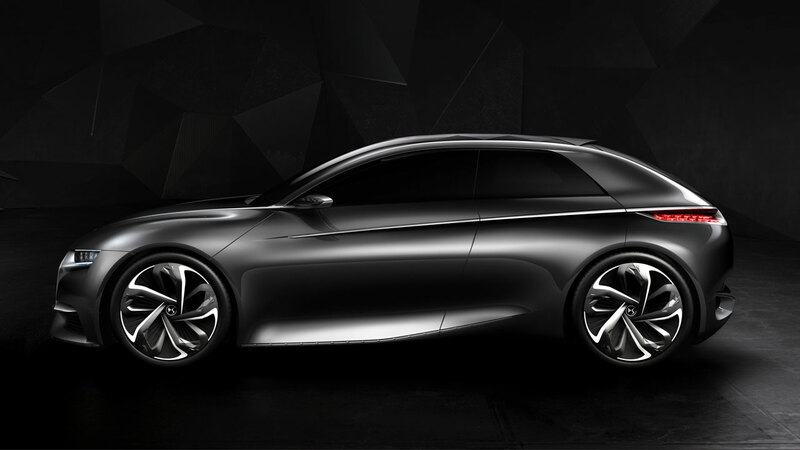 Viewed from the side, the lines of DIVINE DS form a sharp sweep along the length of the car, with the first stroke of the designer’s pen clearly visible. The dramatic waistline emerges as a circle around the rear lights and tapers away naturally at the front. Underlined by a chrome strip, this distinctive signature makes the whole body appear tauter and more dynamic. The chrome strip also cleverly conceals the door handles. On the lower side panels is a line of finely sculpted chrome, subtly highlighting the elegant body shape and bringing to mind the interior console design. Another major styling highlight is the roof, which is truly unique with a design resembling the scales of a reptile. Playing on contrasts, these scales feature alternating effects – matt and satin, opaque and transparent – to play on the light inside and outside the car through changing reflections. The scale pattern extends over the rear window and can also be seen on the door mirrors. This forms a unique and enchanting display that contrasts with the sensual curves of the car’s rear. The cabin of DIVINE DS also features a spectacular display of contrasts, between the contours and relief of the driver’s cockpit and the flowing lines of the passenger seat. On the passenger side, a single continuous drape enfolds the console and dashboard, forming a twist as it reaches the door inserts. The airy-looking drape enfolds the passenger, taking them into a world of haute couture, far removed from conventional automotive standards – a truly original sensory experience. The driver’s side is a showcase of advanced technology. The central console, which resembles a ‘backbone’ for the car, sets out the driving functions. Its white gold covering is both crystalline and majestic, contributing to the refinement and sophistication of this original interior. Main features include special toggle switches decorated with carefully selected gemstones and, in the middle, a digital clock with a stone set in its surround. In this instance, black granite is used with gold speckles that echo the design of the central console. The rectangular steering wheel is a work of sculpture, promising new driving sensations. The seats represent a new and visually striking take on the existing DS watch strap design. They are upholstered in full-grain aniline leather that was selected, by the Seton tannery, for its exceptional quality and specially tanned finish. The warmth of the grey colour highlights the metallic touches of white gold and each separate ambience. ‘Mâle’ is a sober, contemporary creation, alternating carbon fibre – used as a textile – and glazed, burnished leather. A blend of highly masculine materials, this option invites the driver to take the wheel. There is also pearl stitching in red and black to complete the look. ‘Parisienne Chic’ is an invitation into a world of Parisian sophistication and elegance. Full grain ivory-coloured leather of exceptional quality is allied with pleated silk and satin, which is embroidered with beads and crystals. Sewn by the globally recognised firm Lesage, these embroideries echo the form of the DS monogramme. ‘Fatale Punk’ creates a bolder ambience, with a darker and more glamorous touch. The dominant note is provided by deep black, padded leather studded with crystals, and clipped-in subtle touches like a piercing. The door panel scrolls are covered in Swarovski fabric, a material that shimmers with millions of tiny crystals. 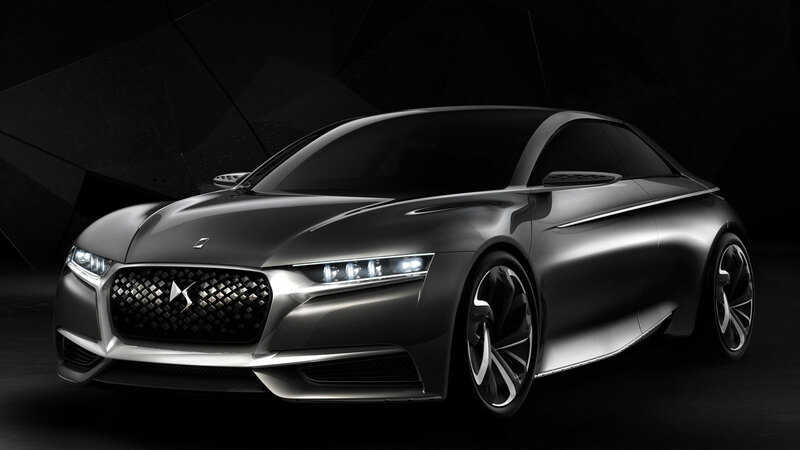 More than a concept car, DIVINE DS represents a meeting of minds from several leading companies, each illustrating expertise and excellence – a first in the automotive industry. “We want the best for DS: the best partners, people who are recognised as setting the standard in their field. 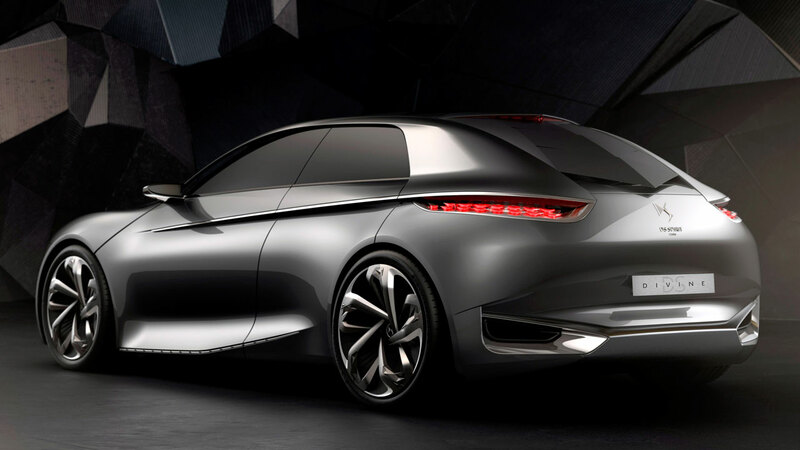 And we also want to be the first to explore new territories,” says Thierry Metroz, Head of DS styling. Crystals from Swarovski: Recognised as a standard-setter in the world of fashion and luxury, Swarovski has developed a reputation for excellence, working with the leading names in French fashion. The magic lies, to a great extent, in the manufacturing secrets of Swarovski crystals and in the cutting and polishing process that gives them their sophisticated sparkle. Today, the DS brand is calling upon this prestigious firm to adorn the exterior lines of DIVINE DS and to decorate the headlights for an alluring finish. 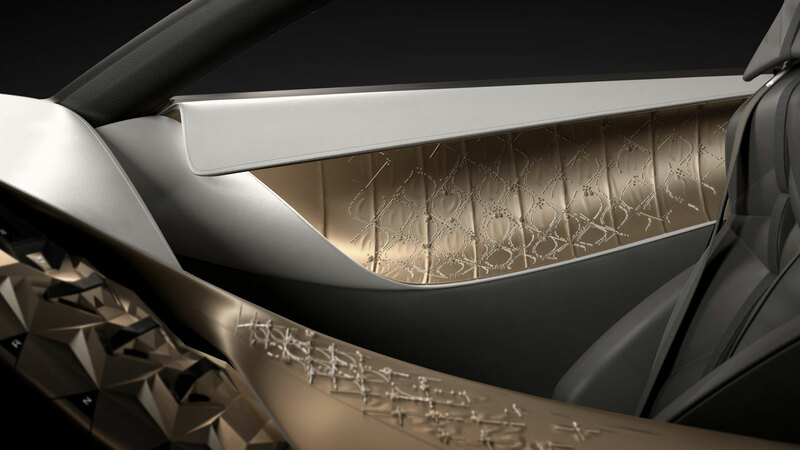 Inside the car, these legendary crystals feature on the door panels and dashboard in a series of sophisticated touches. Lesage embroidery: As part of another cooperation project that is truly exceptional within the automotive industry, DS has worked with Maison Lesage, France’s most prestigious embroidery house. Founded in 1860, Lesage works with many leading fashion designers. Demanding meticulous work by hand, it draws upon precious materials such as silk, beads and crystals. The art of embroidery comes into its own in DIVINE DS with the ‘Parisienne Chic’ Hyper-typage, enhancing the cabin materials and giving new emphasis to the DS monogramme. The light signature at the front was inspired by DS 3. It maintains the principle of independent LED modules, designed to resemble diamonds in a setting. With Swarovski crystal fabric at the base of each unit, to bring the lights to life, these headlights combine sequential indicators with laser technology. The laser headlights of DIVINE DS comprise two high-powered laser diodes per module. These diodes are 50% more powerful than conventional LED lights in terms of their lighting intensity. The laser function works with the LED headlights from speeds of 60kph. The light beam is conducted to the headlight through optical fibre for instant, precise adjustment. The laser diodes are located in the engine compartment, so they are protected in the event of impact or if the headlight lens shatters. Laser lighting is an efficient technology as its durability is equivalent to the life of the vehicle. Also, these laser lights do not dazzle other road users – cameras are used to identify oncoming vehicles and to automatically adjust the lighting. At the rear, the full-LED lights feature retracting scales that play with the light and bring them to life. These scales light up at night or during braking, creating a magical effect that is complemented by the operation of the sequential indicators. 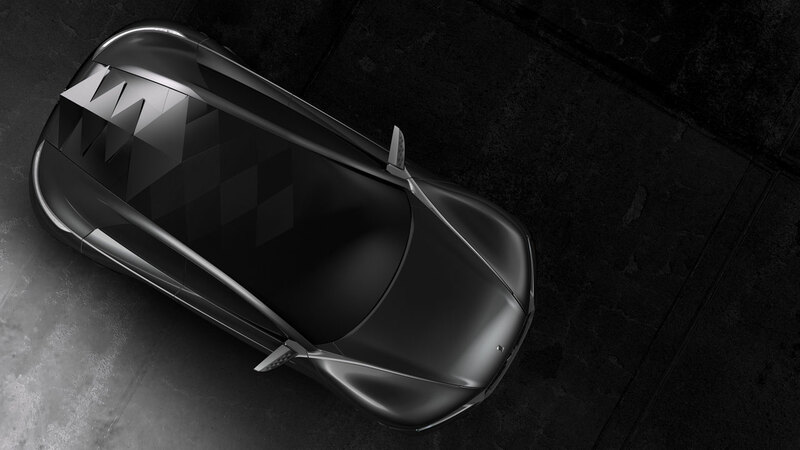 The rear window is equipped with opening facets that optimise the aerodynamic performance of DIVINE DS. One of these facets includes a camera for enhanced rear visibility. Here again, technology is contributing to style with this ‘reptilian’ display. The 20-inch alloy wheels feature an innovative design with the floating spokes appearing to be disconnected from the hubs. This is another technological feat, one that gives the wheels a unique look suggesting the aerodynamic performance of DIVINE DS. 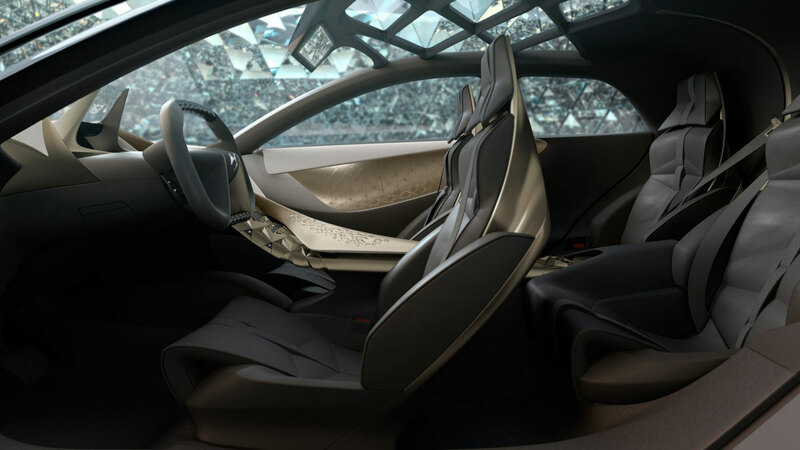 The cabin of DIVINE DS showcases its in-car technologies, with a cockpit driving position featuring an array of digital functions. These technologies contribute to driving pleasure as well as to interior design, since they enhance the interior sophistication of DIVINE DS. A perfect fit with the concept’s dynamic character, DIVINE DS is equipped with the turbocharged direct-injection 1.6 THP petrol engine developing 270bhp. With a power maximum output of 199kW at 6,000rpm and maximum torque of 330Nm between 1,900 and 5,500 rpm, this is an engine with outstanding performance. Meeting high standards in terms of performance does not mean sacrificing environmental concerns. This engine is Euro 6 compliant and emits just 145g/km of CO2. 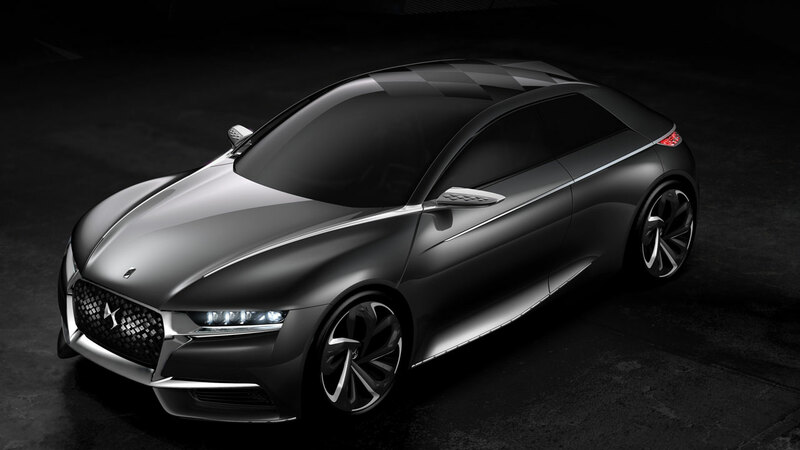 The DIVINE DS concept was unveiled in Paris on Thursday 4 September 2014 and was displayed at the Chantilly Concours d’Elégance style event on Sunday 7 September, then at the Paris Motor Show from Thursday 2 October 2014.